Tennessee Eastman Company, Kingsport, in the 1950s. In the 1880s George Eastman (1854-1932) founded Kodak, a camera and photographic film manufacturer based in Rochester, New York. His Eastman Kodak Company was a multinational corporation that soon dominated the film market and led the way in the mass production of inexpensive and simple cameras. The production of film, however, remained the key to Kodak’s huge profits. When World War I disrupted the German supply of photographic paper, optical glass, gelatin, and an assortment of chemicals including methanol, acetic acid, and acetone, Kodak faced a serious problem. Attracted by the forests of the Appalachian South as a source of raw materials for the manufacture of methanol and acetone and actively recruited by the planned industrial community of Kingsport and officials of the Clinchfield Railroad, George Eastman visited East Tennessee in July 1920. He purchased thirty-five acres and the factory buildings of the American Wood Reduction Company from the U.S. government as the base for the Tennessee Eastman Corporation. The original purchase expanded to include an additional three hundred acres and represented an investment of more than $1 million. 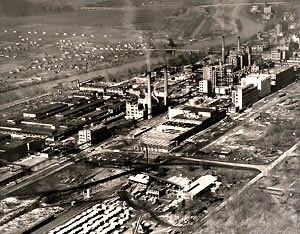 Tennessee Eastman initially manufactured methanol, methyl acetone, and various by-products through the dry distillation of wood, but Eastman soon realized the Kingsport site would be ideal for the production of photographic chemicals, enabling him to maintain an independent supply of chemicals for his photographic processes. An ongoing federal antitrust suit against Kodak for its acquisition of other camera companies also contributed to the development of Tennessee Eastman. In 1921 Eastman ended six years of litigation by agreeing to end its attempt to create a monopoly in the camera field; instead it refocused its investments into the development of plants, like that at Kingsport, to produce the basic materials for film manufacture. Officially incorporated July 17, 1920, Tennessee Eastman Corporation (TEC) began with $3.5 million in capital. Perley S. Wilcox (1874-1953) was elected a director and appointed general manager; he rose to the position of vice-president in 1921. As head of TEC, he eventually held the honorary position of chairman of the board of the Eastman Kodak Company, but never served as president or chief executive officer. James C. White became general plant superintendent. In the early years, wood was used to make methanol, a chemical needed for photographic film. By-products included charcoal, acetic acid, hardwood pitch, and wood preserving oil. In the mid-1920s, two developments of significance shaped the company’s direction. The demand for safety film for home movies and the need for X-ray film coincided with the successful research of Eastman chemists and resulted in the production of acetic anhydride from pyroligneous acid, one of the primary ingredients used in manufacturing cellulose acetate, the base for safety film. Cellulose acetate production was transferred from Kodak Park to TEC in 1929. That same year, TEC began production of acetic anhydride. In 1930 efforts began to develop the production of cellulose acetate yarn, and by 1931 acetate yarn was being produced on a large scale. In the early 1930s, TEC employed A. M. Tenney Associates to market cellulose acetate textiles. In conjunction with the acetate yarn production, TEC initiated production of Tenite cellulosic plastics, acetate dyestuffs, as well as Tenite II, a cellulose acetate butyrate molding composition. Utilized by the automobile and communications industry, these products had far-ranging ramifications for design and methods of production. By 1940 annual sales had reached nearly $29 million. In 1930 Kodak also transferred the manufacture of hyroquinone from Passaic Junction, New Jersey, to Kingsport. General Leslie Groves, commanding officer of the Manhattan Project, recognized TEC’s achievement in the production of RDX and utilized the resources of the company in the operation of the Y-12 plant (known as Clinton Engineering Works) at Oak Ridge, Tennessee. Dr. Fred Conklin served as works manager at the Y-12 plant, and Eastman scientists and engineers were transferred from Kingsport to Oak Ridge. Eastman managed the plant from January 1943 to May 1947, when the company requested permission to be relieved of the responsibility for Y-12. In the 1950s acetate yarn became TEC’s major product, with annual sales of $130 million. In the early 1950s Eastman expanded production and formed the Texas Eastman Company (Longview). The Tennessee Products Division moved from Rochester to Kingsport. Under the leadership of Wilcox and White and with Dr. James McNally as head of research, TEC’s Tenite plastics remained competitive in the emerging global market. Eastman also began large scale production of Chromspun, a dyed-in-solution acetate textile fiber and cellulose acetate filter tow for cigarettes. Verel, a modified acrylic fiber, was introduced as a part of TEC’s textile fiber line in 1956. Two significant 1959 product developments included Eastman 910 Adhesive and Kodak polyester fiber. During the next two decades and into the 1980s, Dr. L. K. Eilers, Harry D. McNeely, and Toy F. Reid continued previous efforts and spearheaded new developments. TEC began manufacturing scores of products now familiar to everyone including polyester fibers for apparel and home furnishings and plastics for automobiles. By 1960 filter tow was TEC’s most lucrative product; that year company sales reached $250 million. Texas Eastman introduced Tenite polypropylene, and TEC began production of UVEX cellulose acetate butyrate sheets used for large weather-resistant outdoor signs. The formation of Eastman Chemicals Division of Eastman Kodak Company (1968) included TEC, Texas Eastman, Carolina Eastman Company, Eastman Chemical Products, Inc., and related marketing organizations, Holston Defense Corporation, Ectona Fibres Limited, Bays Mountain Construction Company, and Caddo Construction Company. During the 1970s annual sales reached approximately $590 million, primarily as a result of polyester fibers and filter tow, and the company expanded to Batesville, Arkansas. One of the greatest product success stories was the introduction of Kodapak polyester plastic for use in the manufacture of beverage bottles. PET plastic (polyethylene terephthalate), developed in the late 1970s, enjoyed a worldwide success. After the oil embargoes of the 1970s, Eastman recognized the advantage of independence from oil supplies and created a coal gasification facility. The plant produces acetic anhydride from coal instead of petroleum, for which it earned the twenty-eighth biennial Kirkpatrick Chemical Engineering Achievement Award. TEC became the first U.S. commercial manufacturer to produce a new generation of industrial chemicals that used second-generation coal-gasification technology to prepare feedstocks. The 1990s brought recognition and important changes to TEC. In December 1993 President William J. Clinton presented Eastman with the prestigious Malcolm Baldrige National Quality Award. On January 1, 1994, Eastman Kodak and Eastman Chemical Company became separate concerns. Eastman Chemical Company became an independent, publicly owned company traded on the New York Stock Exchange. Its corporate headquarters remained in Kingsport. Earnest W. Deavenport Jr. serves as chairman and CEO of Eastman Chemical Company. Its 2000 sales totaled $5.3 billion, and it is the fifth largest private employer in Tennessee, with 11,100 workers.